It is said that to gaze upon the dragon is to ensure one’s eternal life. Play Eastern Dragon mobile slot and it will certainly feel like an eternity. After the successful launch of Foxin Wins on the mobile platform, we had high hopes for the next NextGen slot release. Not a bad game as such, it simply meets our expectations of every other NextGen mobile slot out there – namely a very standard 20 paylines, 5 reel video slot. That said, give this chinese dragon themed mobile slot a little credit, the graphics are actually very well done. The Asian theme, popular with many, looks authentic, and the Wild Dragon symbol, in particular, catches our eye every time. The lotus and carp are a little generic, but then so are the 10-A high card symbols, and we don’t mind those that much. We particularly love the animation of the golden chinese coins flying onto the screen whenever a big win occurs, giving some life to an otherwise repetitive video slot. For once, we are also happy to say that the sounds are also unique, and instead of putting the same slot sounds as NextGen does for all their mobile slots, this has a catchy bouncy beating of drums and gongs that, indeed, transports you to the far east. So you would think, given that we love the animations from the main game, that NextGen would have put a little effort in the presentation of this slots only feature; free spins. No indeed. Swapping the background colours from red to purple, it took us a couple of seconds to realise we’d started the free spins feature. A little drama to bring the excitement would have been nice. That said, the free spins are frequent enough to make a difference to your balance, but not exciting enough to really care when they come. A simple slot for when you need to spin a few reels on automatic. Wilds: The Fiery Dragon is the wild symbol replacing all symbols except scatters and doubling any winning lines. Free Spins: 15 free games are awarded when a dragon appears on both reel 1 and 5 at the same time. During these free spins all wins are tripled and this feature can be re-triggered. 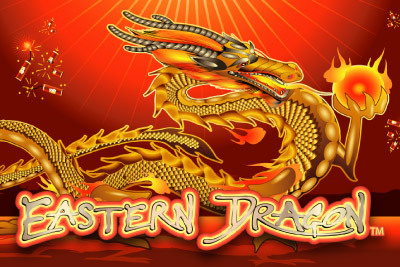 Eastern Dragon is a simple and generic NextGen mobile slot, this one is to be enjoyed on auto-play when you fancy a little eastern influence in your life. Not exciting enough to get more than 3 stars, but good looking enough and frequent hitting free spins deserve a mid-range rating. Best of all, with a wide range between the minimum and maximum bet, Eastern Dragon slot should find a few loyal followers.